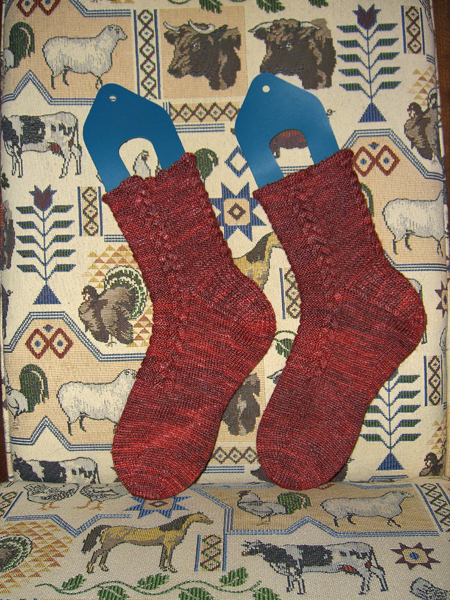 The Cables & Corrugations Socks are finished! Yea! Here they are, doing the toe dance on my favorite rocking chair, because it was a gloomy day with bad light, and I didn’t get home while there was still any light at all. So sorry for the flash pic. But the colors are fairly true. There is a story about the fabric that’s on my chair. But we won’t go into it today, gentle reader, because it involves things like former spouses and such, and today is too good a day to be delving into that particular past. Maybe some gloomy, rainy January weekend. But not today when the grapes are nearing ripeness and the sun might actually make an appearance. The tops of the socks look a little ruffly. You can especially see this in the one that’s on the left. That would be because, instead of using the suggested EZ sewn bind-off, I used a crochet bind-off. I didn’t really have a good reason for doing so. The crochet version is a bit stretchier than the sewn bind-off, but either would have worked. The ruffliness is not apparent when I have these on my feet. 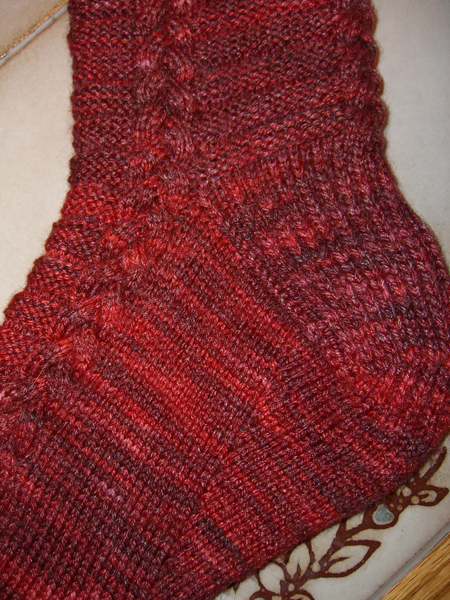 This is a close-up of the heel and the lovely braided cables up the side and back. My camera struggles with this red (although not as much as it struggles with purple). 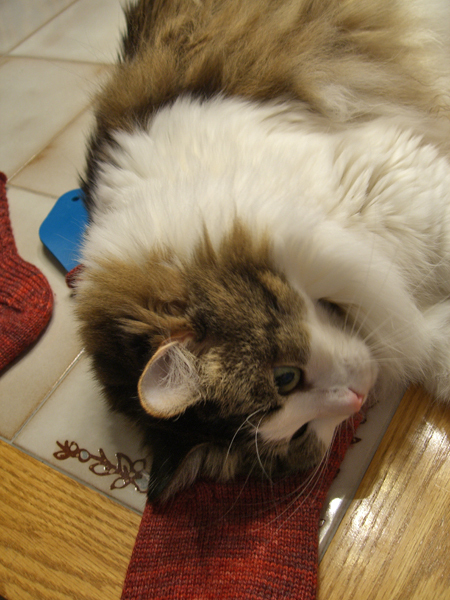 I’ve moved to the dining room table, where the light is a little better for close-ups. But the shine from the bamboo content doesn’t help. Hopefully you can see how pretty the braids turned out. Note the gusset. It’s actually one big gusset instead of two smaller ones, and it starts smack dab in the middle of the bottom of the foot. Isn’t that cool? There are reasons that Cat Bordhi is called the mad scientist of knitting. I tell you, gentle reader, the woman is a genius. Someone else likes these socks, too. The last picture shows what happened about 10 seconds after I snapped the close-up. For a bit there I was not quite sure whether Moo Cow was going to give my socks back. Yarn: Pagewood Farm Hand Dyed Sock Yarn (70% merino, 20% bamboo, 10% nylon / 4oz, 450yd per skein) in colorway Really Red — one skein with a goodly bit left over. This would be plenty of yarn for larger feet in this pattern. Crochet bind-off substituted for EZ sewn bind-off. I followed Cat’s instructions for the pontoon toe, which I switched to a moccasin toe because that was what is shown in the picture. The pontoon toe turned out to be pretty fiddly, requiring the addition of 4 DPNs as well as the 2 circs to execute on two socks at once. I love the way it looks, but not my favorite toe to knit.